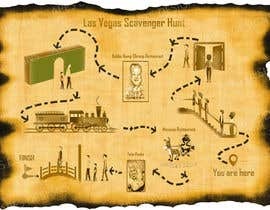 I need a treasure map designed for use in a popular Las Vegas Scavenger Hunt. Your work will be seen by thousands of people every week on the famous Las Vegas Strip. 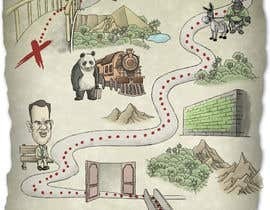 The map, should look like a treasure map - maybe with burnt edges or looking like its old . Size should be regular letter size (8.5x11). 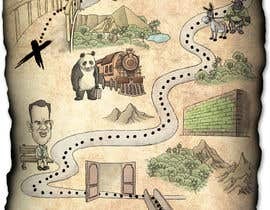 The map is meant to show a group how to get from a starting point to a finish point. So it should have a 'you are here' marker, and then a final cross to indicate where they have to go. Here is the brief for the map - the below points should all show on the map. 1))Starting from the start point, the group have to walk up an escalator. So please provide something that indicates that. 3)The first place they will pass (on left) is a bubba gump shrimp restaurant. To indicate this, please use the image attached named 'forrest'. 4)They will then pass a walgreens. To indicate this find a picture of a green wall. 5)They then pass a panda express. 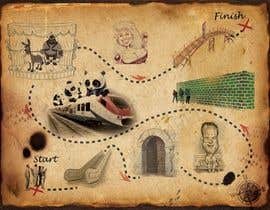 Please do an image of a cartoon panda, next to an express train. 6)Then on the right they pass a mexican restaurant. Please use the image attached named 'donkey'. 7)They then pass a restaurant on the left called twin peaks. I figure it would be funny to have a picture of dolly parton. I have attached one which i think is good, but feel free to get a better one if you want. 8)They then walk through a set of doors, and over a bridge. At the bottom of the bridge on the other side, is where they finish. Please use some imagination, and any questions, please ask. Really looking forward to seeing the results! Please have a look at Entries #8 and #9 . Please check #6 and let me know what you think? Thanks! there are not any images 'mexican'. sorry - its called donkey.